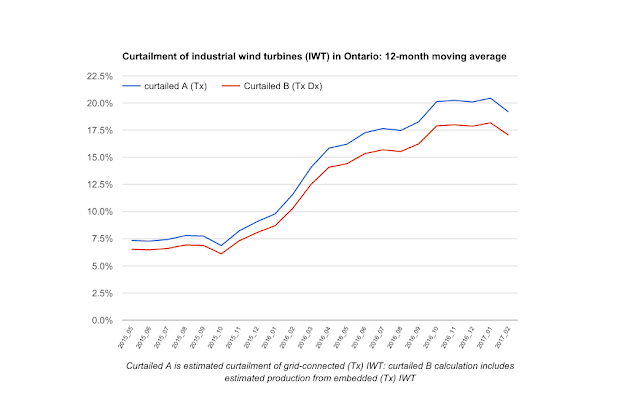 I estimate in 2016 Ontario curtailed approximately 2.3 TWh (billions of kilowatt-hours), up 300% from the 0.734 TWh the IESO (system operator) reported for 2015. None of the IESO's zones showed curtailment levels as high as Gansu and Xinjiang, but I estimate 4 zones has curtailment rates similar to the other regions China has now banned projects from: Bruce (28%), Northwest (23.5%), Southwest (20.6%) and West (19%). 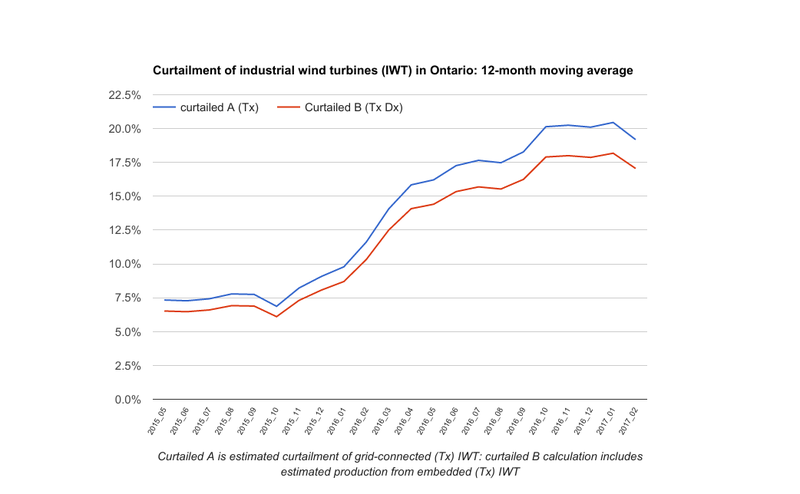 Overall estimation of a total percentage is confused by the fact some industrial wind facilities are embedded in distribution networks - their output is not reported by the IESO, and the IESO is unlikely to be capable of curtailing that supply. For transmission system connected generators, I estimate curtailment in 2016 at 20%, but including estimated embedded generation the figure drops to 18% - still higher than China's 17%. In the fall of 2016 unit 2 (878 MWe) of the Darlington nuclear power plant was removed from service for 3 years as it undergoes refurbishment. An additional 700 MW of natural gas-fired capacity that ran as baseload supply one year ago has been removed from service or re-contracted on a capacity basis (DESTEC 120, Kapuskasing GS 60, Nipigon GS 40, North Bay 60, Iroquois Falls 120, TransAlta Windsor 72, TransAlta Mississauga/Douglas 108, and West Windsor 127). As expected, the initial months of 2017 do show a drop in curtailments, but the highest curtailment periods of a year are still to come.